" [...] Also love that it's open source, i've taken advantage of this to use one of your source files from which i've pulled an image of Carrot [from ep06, where he's standing beside Pepper as the giant zombie bird attacks] i've converted this into an outline i can engrave using my shapeoko 2, which is an open source CNC machine. 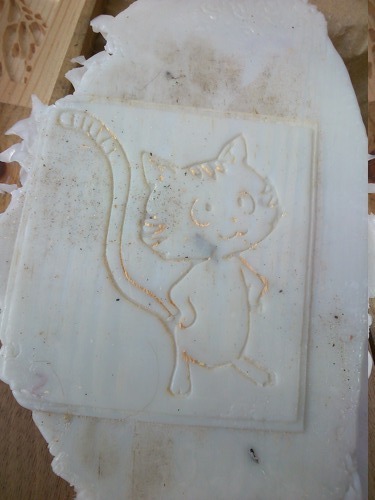 I then used this to make a simple mold which i used to press a sheet of HDPE which was made from cut up milk bottles melted in a sandwich toaster - sounds complex but it's all surprisingly easy, anyway that results in the thing in the picture, it's only a first test but it worked really well. The next stage is I'd like to make a mold for creating a more complex item with the design included, the long-term project i'm working on at the moment is to create designs for kids toys which i, and others, can make and sell - all shared open source and etc of course [...] "
Thanks again for sharing your work !